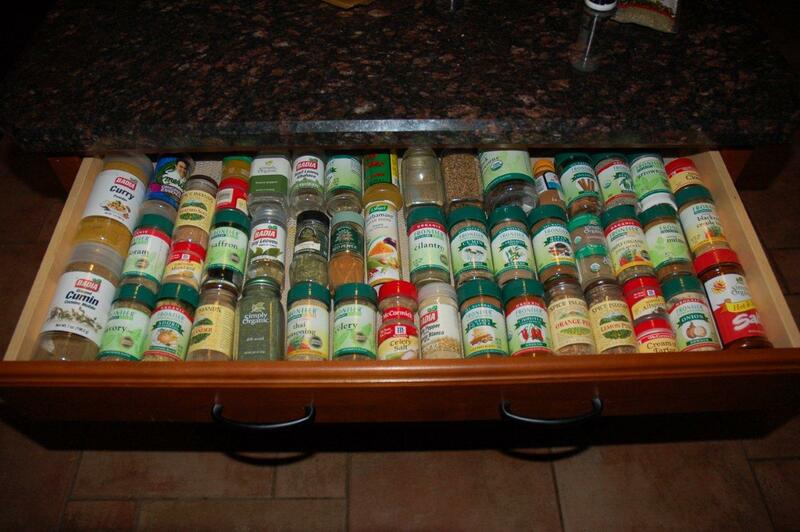 In my last post I asked my subscribers to send me a photo of their spice rack...well I got one! And that's because I asked her to send me the photo :) This one comes from Patience Mack, a technical writer, homeschooling mom, owner of an organic produce and food coop AND owner of Write on Time Publishing in Orlando. Did I miss anything? Is that all? Sounds a lot like my intro. I love this spice drawer and it's filled with lots of organic spices! Takes up minimal space and you can see everything. I wonder if I can find an insert that would fit my 1960's kitchen cabinets? Probably not. Thank you Patience! Now the questions is, who's got more spices? I want to see the mack daddy of all spice cabinets...maybe someone has a "spice pantry"? Send your photos! I just cleaned out my spice cabinet the other day. It was creeping over into another cabinet next to this one, so I went through and pulled out all of the badly expired spices and now they all fit in one cabinet again. I have an alphabetical list posted in the cabinet so I can quickly see what I have on hand before I head to the grocery store. These cabinets are almost 50 years old, and while I'd like to replace them with newer, larger cabinets, they have forced me to keep my "kitchen stuff" to a minimum. Next week I'll be posting photos of my pantry and the week after, my refrigerator....so get yours ready if you want to share photos! Vegan Grocery Deals: Free Westsoy Soymilk times 2! If you shop at Whole Foods (or your grocery store takes WF Coupons) you can get all of these for around $4.00! That is IF you saved the March/April 2011 Whole Deal Coupon Booklet. You can use the "Buy Two Arrowhead Mills Cereals Get One Free WestSoy Soymilk" coupon and match it with the manufacturer coupn that is a "Peel Off" stuck on most Arrowhead Mills products in the store. That gives you TWO FREE Organic Aseptic Soymilks! The cereals pictured are just puffed corn and kamut, nothing else added, but you can buy any of the Arrowhead Mills Cereals. I'm not a big cereal or soymilk fan, but I like to keep these things in my small "stockpile" for this time of year. I live in Florida and I like to have my stockpile "Hurricane Ready" by June. These are things that will stay on the shelf for up to six months and if we don't use them I will donate them. This came in my mailbox today from Dr. Joel Fuhrman. Great information for anyone who wants to reduce their risk of Breast Cancer. 1. Do not drink alcohol. More than fifty studies have been conducted on the influence of alcohol on breast cancer risk. Meta-analyses of these studies have concluded that having one alcoholic drink per day increases risk at least 7-10%, and the risk increases further with more alcohol. In breast cancer survivors, drinking 3-4 alcoholic beverages per week increased the risk of recurrence by 34%. Breast carcinogens have been identified in cigarette smoke, and they are known to enter the bloodstream via the lungs and travel to breast tissue, putting smokers at risk. 3. Do not take estrogen. Cumulative exposure to estrogen is known to be a risk factor for breast cancer. As such, women who have used hormone replacement therapy (HRT) are at risk, and that risk increases with increasing duration of HRT. 4. Have babies and nurse them for two years each. Having children before the age of 24 and having multiple children are both protective against breast cancer. Breastfeeding also contributes to risk reduction, in part by reducing estrogen exposure – longer duration of breastfeeding confers more protection. 5. Reduce consumption of animal protein. Cooked meat (not just red meat, poultry as well) is known to contain breast carcinogens such as PhiP. Consuming more protein and especially dairy products raises blood levels of IGF-1, and elevated IGF-1 levels have been associated with increased in breast cancer risk in many studies. Higher fish consumption in women has also been linked to higher rates of breast cancer. Agricultural and industrial carcinogens, such as dioxins, accumulate in fatty tissues. Humans' primary mode of exposure to these dangerous chemicals is from meat, poultry, fish, and dairy fat. 6. Eat lots of green vegetables, mushrooms, and onions. Following a high-nutrient diet, as described in my book Eat to Live, protects against many chronic diseases, breast cancer included. Green vegetables and mushrooms are the most powerful anti-breast cancer foods. Take note that a vegetarian diet does not show protection against breast cancer as much as a diet rich in green vegetables, mushrooms, onions, berries, and seeds. It is the phytochemical nutrient density and diversity of the diet that offers the most dramatic protection against cancer, not merely the avoidance of meat or fat. Vegetables and fruits have been consistently associated with both reduced risk of breast cancer and improved survival of breast cancer patients. Cruciferous vegetables contain powerful anti-cancer compounds that halt the growth of breast cancer cells and promote excretion of estrogen. Mushrooms block tumor growth and have anti-estrogenic activity – regular consumption of mushrooms – as little as one mushroom per day – has been shown to decrease breast cancer risk by up to 60-70%.Organosulfur compounds in onions and garlic also prevent the development of cancers by detoxifying carcinogens, halting cancer cell growth, and preventing tumors from obtaining a blood supply. Take a multivitamin that does not contain folic acid, maintain healthy vitamin D levels, and take at least 100 mg of DHA daily. Synthetic folic acid in multivitamins and prenatal vitamins has been associated with increased risk of breast cancer, whereas folate from natural food sources is associated with decreased risk.Three-quarters of women who have breast cancer are vitamin D deficient, and maintaining sufficient blood vitamin D levels can decrease risk of breast cancer by up to 45%. Omega-3 fatty acid consumption is associated with reduced cancer incidence. The omega-3 DHA has anti-inflammatory effects and also blocks tumor angiogenesis and tumor cell growth. 8. Use one tablespoon of ground flaxseed daily. Flaxseed lignans have anti-estrogenic effects and also inhibit cell growth in breast tumors. 9. Don't grill or fry foods. Steaming vegetables or making vegetable soups should be the major extent of cooking. High temperature dry cooking produces compounds known to be carcinogenic – acrylamides (formed in starchy foods) and heterocyclic amines (formed in meats). 10. Exercise at least three hours a week and maintain a lean body with little body fat. An analysis of 73 different studies concluded that women with high levels of physical activity reduced their risk of breast cancer by 25%.49, 50 Maintaining a healthy weight is also extremely important, since 17% of breast cancer cases can be attributed to obesity alone. I've been experimenting with Gluten Free pancakes for awhile and what I notice is that all the recipes use 1/4 cup of oil or more in the batter. Well, I try to avoid using oil so I had to come up with my own recipe and after many completely botched attempts, I think I have a winner. Now it's not completely oil free because I do spray oil in the pan before the first pancake, but for the most part, you are getting a much lower fat pancake. Put the first seven ingredients in your food processor or high powered blender. Blend on low to medium speed until well combined. Add the last three ingredients. Blend on low until well combined. Let the batter sit for 5 to 10 minutes. Heat pan on medium low heat until hot. Spray pan with coconut oil and pour batter to desired size. Decorate with shredded coconut, dried fruit, walnuts, berries, or whatever! Serve with organic maple syrup or raw blue agave nectar. This makes 6 large pancakes and 8-10 smaller pancakes. Try it and post in the comments below! Q: What do you do with over ripe watermelon (on the mushy side), especially if it's organic and you paid a lot for it! A: Well don't take it back to the store! It's perfectly sweet, so make Blueberry Watermelon Coolers! First, I juiced the entire medium size watermelon (okay, except for the rind) in my Omega 8005 juicer. "How can we make Kale delicious so we can eat more of it?" That's my daily Mantra for 2011! And BONUS, this recipe is Gluten Free! Jae says to cook the garlic in the olive oil, but I just threw all of the ingredients from the garlic down to the pepper into the Vitamix! I steamed the kale in a steamer basked while cooking the noodles. Then I poured the sauce from the Vitamix into a pan to warm and assembled everything when the noodles were done. So, it all took about 17 minutes total, maybe 20 if you count waiting for the water to boil for the noodles. I have a quick boil setting on my stove top. Try this one out and let me know how your kids and/or significant other like it! COST: Not counting condiments and seasonings, the total cost of the meal was $6.28! My friend Kristan's daughter Sarah made this beautiful sign for her for Mother's Day. If you are a follower of Dr. Fuhrman's "Eat to Live" plant based diet, you will appreciate this as much as I do! 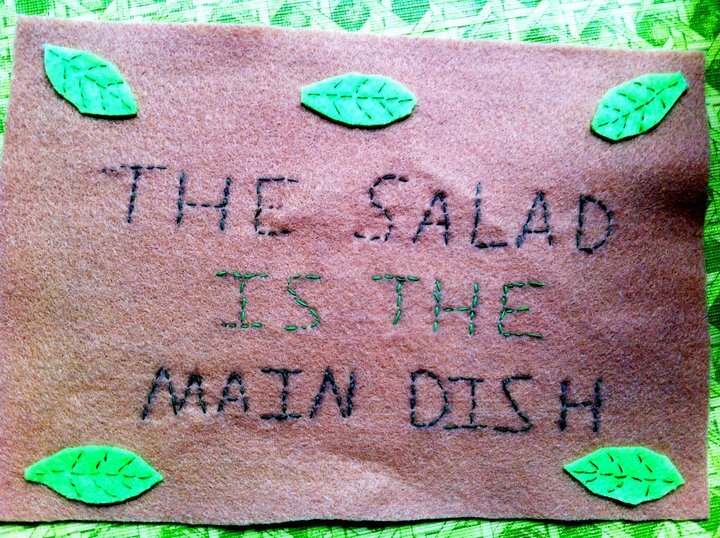 In his book he writes that we should keep a sign in the kitchen that says "The Salad is the Main Dish" to remind us that raw plant foods should make up the majority of what we eat at each meal. What a thoughtful gift, Sarah! Mango Salsa! And this is really special stuff because 1. My husband made it and he doesn't make anything that involves chopping but maybe once a year and 2. he used tomatoes and onions from our backyard garden! We finished this up in two days, now it's my turn to make more. What thoughtful gifts did you get or give for Mother's Day? Please share in the comments below! The 2011 Vegetarian Summerfest is coming up July 5-9th in Johnstown, PA. Hosted by the North American Vegetarian Society, this 5 day event includes educational sessions with amazing speakers from the Vegan Plant Based Nutrition world like Caldwell Esseslstyn, Neal Barnard, Colleen Patrick-Goudreau, Michael Greger, Melanie Joy, and T. Colin Campbell. It also includes vegan meals prepared under the direction of Ken Bergeron, an international chef and opportunities to network with other vegan and vegetarian families. This is an amazing opportunity for anyone who is somewhat new to vegetarianism. I've wanted to attend Summerfest for years, but now my goal is not to attend as a participant but as a speaker or food prep demonstrator within the next 3 years! I would love to hear from any of my subscribers who have attended Summerfest or plan to? Please post in the comments section below! We have so many tomatoes coming out of our garden that I have trouble using them up before they go bad! Well, this recipe was one of the best uses of garden tomatoes. So easy to make and so delicious! 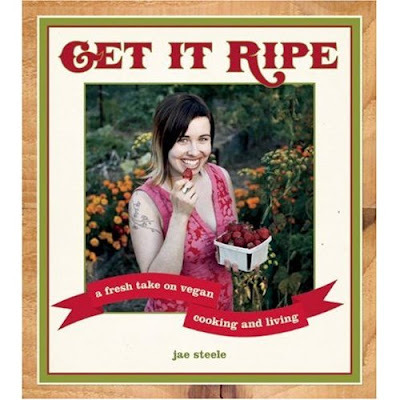 The recipe comes from Jae Steele's book "Get It Ripe: A Fresh Take on Vegan Cooking and Living". Serves 5-6. Process the soaked cashews and water in a food processor or blender for about 1 min until very smooth, and set aside. Heat broth on medium high heat. Add the onions and sautee until onions soften and begin to turn translucent. Add the 3 cups tomatoes, garlic, basil or dill, syrup, salt and cayenne, and stir to combine. Increase heat to bring to a boil. Once boiling, reduce heat, cover, and simmer for 20-30 minutes (the longer the better), stirring occasionally. Remove from heat. Puree soup with a hand blender (be careful of hot liquid) while slowly adding cashew milk (otherwise transfer to a food processor or blender to puree and add cashew milk then return to pot) for about 30 seconds or until smooth. Stir in the 2 diced tomatoes for finishing and re-heat for another 5 minutes.